Nintendo Labo goes in the recycling bin! 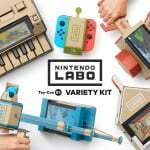 Last week we saw Nintendo Labo: Toy-Con 01: Variety Kit make a strong debut in the UK software charts at position three. Unfortunately for Nintendo, it's fallen out of favour this week in the UK, slipping all the way to 13th place. 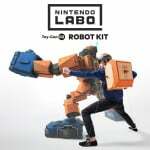 Poor old Nintendo Labo Toy-Con 02: Robot Kit, only charted at 20th place last week. This week it's not anywhere to be found in the UK top 40. Ouch! So there we have it folks, UK consumers really don't like buying cardboard kits it would seem. The bean counters over at PlayStation UK will no doubt be delighted by the excellent God of War maintaining it's first place supremacy. But hot on Kratos' heels is the rather charming Donkey Kong Country: Tropical Freeze which rolls effortlessly into second place this week. Of course, there's no doubt of the quality of Tropical Freeze, but it did appear to struggle on its Wii U launch. Mainly because Wii U itself was doing so badly by that point. It's great to see this game get the attention it deserves on Nintendo's portable powerhouse. Lots of Nintendo Switch games in the top 20 this week. Mario Kart 8 Deluxe and Super Mario Odyssey prove to be as popular as ever with UK consumers. Let us know what you think about the success of Donkey Kong and rapid decline of Labo with a comment below. To be honest, I don't know how hard Nintendo pushed and is pushing Labo outside of seeing some articles about it on gaming websites. I don't have normal TV anymore but I'd hope it would be putting out a bunch of TV ads and stuff for this. @impurekind There are plenty of TV ads in the UK. I have my two Labo boxes sitting on a chair barely touched. Nothing against it but finding the time to devote to actually making the pieces is more difficult than I anticipated. Not picked up Donkey Kong yet, purely as its full price and I played through the Wii U version. But I will surely get it eventually. Roll on Hyrule Warriors next week. Why is labo put vs actual games? Labo is a toy, is not really a game. Well it's not that suprising is it? If I had the choice between one of the greatest 2D platformers ever made for £45/£50 or some gimmicky pieces of cardboard for at least £55 I know what I would pick. Glad to see DKC doing well, despite the constant negative ramblings on any Wii U port. It proves again people want these games on a better system. Labo's not for me, but I don't hate on it. It's kind of a niche gimmick, so it's not surprising to see an initial burst then drop off. Besides that, it's more a toy than an actual game, so the comparison is not exactly fair. Being a toy, I expect its sales to plateau, rather than the up and down games have. @Equinox Maybe so. Though I am looking forward to actually getting round to it. I'm a big sucker for fishing and the motorbike game looked quite interesting (and the whole motion based track creation). But yeah being able to count it as a family activity would certainly help it along. Hope your nephew enjoyed it too! While it's good to see Donkey Kong in the charts and other Wii u ports in the future, it does seem as though the faithful Nintendo gamer who bought the Wii u and then the Switch is now the second class citizen. All looks good for the Switch owners who didn't buy the Wii u, with Donkey Kong and other ports being new to them. While the faithful are being asked to pay more for a port or put up with what is now an AAA game famine. What was sold as a home games console that can also be played on the move, now looks like a handheld machine. Tropical Freeze just being number 2 behind God of War being in charts for weeks already is a sign of average sale numbers. Labo being on number 13 is bad. @zool You're not "being asked" to buy anything. I bought most of the major games on Wii U and I'm still finding plenty of AAA games to play, and I only double dipped with MK8D. This is the quiet part of the year, things should pick up the pace in June/July. These are UK numbers, Nintendo has generally struggled to maintain consistency in that market since the N64. I am a bit more surprised so many Xbox One games maintain on that list, though. Can't wait to hear specific numbers on sales for DK:TF. I'm sure the $60 price tag is a good decision. @Equinox This is the big point: Labo is a toy first and foremost, so its sales aren’t front-loaded like a game. It’s the kind of thing that will receive a lot of marketing during Christmas for parents. @Faruko Well I just been shopping at a 24/7 Tesco supermarket and, though they don't sell Nintendo consoles or games - they did have a massive Labo stand right next to the video games section - and no they don't sell toys. It wasn't a normal shelf it was a custom built unit to advertise Labo and display the large boxes. So Nintendo would have paid Tesco to place it where they did - meaning Nintendo sees it as a game. 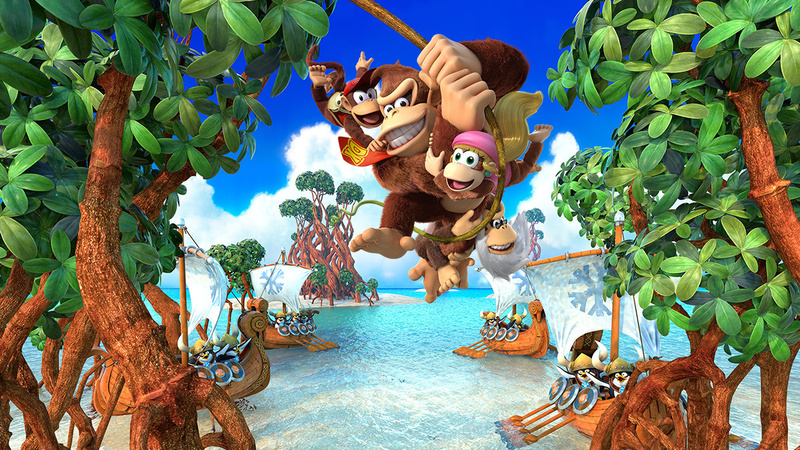 And watch DK tropical freeze storm the US charts also. If people are still wondering why switch is getting Wii U ports then I dunno what to say. Clearly there is an audience that have never played these games. Releasing ports on Switch really is a no brainer. Hope people are recycling the cardboard and not just chucking it in the bin. Well at least it's bio-degradable. I bought Tropical Freeze, as never got the Wii U version, great game. Agreed. I've never understood port hate. There's always a market for it on any console. Me personally, I loved Tropical Freeze on Wii U, but didn't feel a need to re-purchase it. And yet, if someone else wants to buy it for Switch, then that's awesome, go for it. See how that works? You can either buy it, or don't buy it. @impurekind In the U.S. Labo is being advertised a lot right now on Disney Channel and others. @impurekind It's very niche I would say and not for people without young kids so I expect it'll truck along for birthday as Christmas's etc. My sister got it for her husband and the kids to play with so the market is limited I guess. @Faruko Seeing as Labo requires game software to function and a video game console to play, I’d say it’s fair to list it among other video games in the sales charts. I mean, you actually are purchasing a game card as part of the kit, right? @Mr_Pepperami It's dangerous to banana slamma alone! Also Tempted by Tropical Freeze but not the best time at the moment. As for Labo, remains to be seen whether it will succeed or fail. I commend Nintendo for trying something new but they have to be ready to accept that any risk comes with the potential of failure. Great to see under-appreciated Wii U gems getting a wider audience. Bring on Captain Toad!! I agree about the marketing. I finally saw a TV advert for Labo and it was awful. I wouldn't buy it based on that. The launch trailer was far more effective, and more in line with how it was pitched in Japan. Also it's been sitting in boxes on a shelf here in the UK, where in Japan there have been displays with the models built up. I'm still enjoying the product, but the EU marketing team need ot be recycled. @Kimyonaakuma surely the versatility of the switch is precisely why labo can exist? And it should - it’s excellent and it’s a shame it’s not sold as well as others as it has enormous potential . @MoonKnight7 exactly. Nobody is forced to re-buy on switch. Why people would prefer others to not play games i just don't understand. It's great to see a wider audience appreciate how good DK tropical freeze is. Don't care for Labo one bit but I can see it's appeal to a certain audience, and while others will engage with it, the main target audience isn't prevalent on Switch yet. Nintendo's general aim is clearly for Labo to sell systems to that audience (and their parents! ), and that means a projected steady sales flow for birthdays through the year culminating in Christmas. Any analysis prior to the Christmas period on Labo's success or failure is a waste of time. Incidentally in the individual formats chart for revenue, the Variety and Robot kit placed 7th and 16th this week after being 2nd and 8th last week respectively, make of that what you will. P.S. Great to see some appreciation for DKC:TF. Couldn't justify buying it again, yet, but hopefully it's delighting a new audience like it did me on the Wii U. @STAGGLY I was thinking of it's versatility as the various ways that you can play the same game with the same experience in different ways, even if you're not at home. You have a good point by saying that Labo is possible due to it's versatile nature but I think it kind of defeats the concept of having a portable home console. But I'm not the target audience for Labo so my priorities are probably quite different..
@Kimyonaakuma The versatility of the Switch is one of the reasons why it's so popular. A cardboard robot suit and a fishing rod kind of showcase that versatility. @Sabroni Yeah it is in a way but it takes away some of the main features such as the being able to use the dock for the TV. It defeats the purpose of a hybrid console, but as I said before this could be amazing for kids for all I know. Personally I don't think it's great because being able to play anywhere, anytime (as the ads keep saying! ) is the main selling point to me. It's not practical to do that with a cardboard fishing rod and house. That's a great debut for DKC:TP but I can't help but think that Mario Kart 8 Deluxe sitting at number 5 a year after release is worthy of highlight. I think the UK is (slowly) coming round to the Switch. 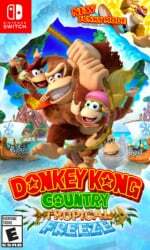 The Switch version of Donkey Kong Country Tropical Freeze sold 53% faster than the Wii U version at launch. This makes it the first time where a Switch port has outsold the original game by such a notable margin. Mario Kart 8 DX launched with higher sales than the original Mario Kart 8, but not by that much (i.e. 15% higher IIRC). The launch sales of Pokken DX and Bayonetta 1/2 on Switch were lower than the launch sales of their Wii U counterparts. DKC:TF is a fantastic game, one of the few Wii U ports that I was happy to double dip for. Like @ekwcll said though, bundling DKC:R with it (at least as a Bayonetta style download) would have been great. Interesting, as the load times for DKC Tropical Freeze on Switch are also about 53% faster than the Wii U version. And I imagine newer players will get through the game 53% faster with Funky Mode at their disposal. 53% faster is what this game is all about. Kinda strange not seeing GTA 5 on the top 10. I won’t be surprised if it bounces back on there. Anyways, good for DK. Not really interested in Tropical Freeze not because it’s a Wii U game, but because I just couldn’t really get into when it first came out some years back. I could give it another try but it will be awhile before I do that. @Kimyonaakuma I don't get the "being asked to" narrative either. Do people have no autonomy over their purchasing decisions? My local supermarket once started selling dragonfruit. I don't really like dragonfruit, even if it looks cool and has a badass name. So I didn't buy it. Nobody asked me to buy it either. I wasn't like, "YO WHAT'S ALL THIS DRAGONFRUIT NONSENSE YOU EXPECT ME TO BUY THIS CRAZY FRUIT THAT'S RIDICULOUS WHO DO YOU THINK I AM AND WHY ARE YOU ASKING THIS OF ME!?!?" I just didn't buy the dragonfruit. And now I don't think they sell dragonfruit. True story. LABO is just not good enough for the long run. A gimmick is a gimmick! @Maxz Yeah I don't understand it, just because the game is available doesn't mean you have to buy it. Make your own decisions! People have overreacted to Wii U ports since the Switch had it's first major games reveal, yet nobody complains as much about third party ports. I'm just going to buy what interests me because that's as much as I can share my opinion as a consumer. Complaints do less than sales figures sadly. Dragonfruits are really disappointing... but they look so cool! It's a relevant story though, who knew that they could be such a great example? @XenoShaun Same here. Labo is just sitting there barely touched due to the energy and time it takes to build. I regret my purchase. Also, good for DK. It’s a fantastic game and probably in the top 5 platformers of all-time for me. I've seen only one labo advertisement in its campaign. Doom! Nice to see that game in the list! It’s great on the Switch! DK Country’s sales were quite large and according to gameindustry.biz, the game sold 53.7% more in its first week than the Wii U version did, and already accounts for 17% of total DK Country sales on a combined basis with the Wii U.
I’ve seen no ads, at least on the US. I assume the push will come over the holidays. It is very strange they did not push the marketing on this, which given its odd function, is a big mistake. It needs a big push out the gate to reach non core gamers, as this is aimed at kids, families and the odd person without kids who does find it interesting (me). @justin233 I'm not yet sure I regret it, as I am sure I will enjoy it eventually, but that does lead to the thought that I jumped on buying it too early. Likely due to the fear of stock vanishing and never being seen again (as Nintendo has programmed us to feel). The second kit seems to be going up in price online currently over here. No point in beating a dead horse - tons of people called it here on Labo. Time to move on and make great games. @XenoShaun Maybe regret wasn’t the right word to use. I don’t really regret it, but also feel like I jumped the gun in much the same way you described. I wish I’d waited a couple weeks and gotten DK instead but it wasn’t out yet. Oh well I guess. As expected. Nintendo fans bought Labo but nobody else was interested. Generic Shooters and FIFA filling out most of UK sales charts!?...... never!? @Agramonte Why not just make great games, period? Why specify handheld games? Go Donkey Kong! That’s awesome! This game is amazing and my absolute favourite in the series. I’m almost feel tempted to pick it up again on Switch. No, the Wii U simply didn't have it's best games yet when DK was first released. In fact, DK was probably the best game on the system when it was released. The Wii U library wasn't too good until Smash was released. A really good game from a well known Nintendo series doing well? Unsurprising but nice to hear. "Nintendo Labo goes in the recycling bin!" Tropical Freeze Switch sales only dropped 32% over its 2nd week, which is an unusually small 1st-to-2nd week sales decline, especially for a port of a 2D sidescroller. In fact, Tropical Freeze on Switch sold more during its 2nd week than Tropical Freeze on Wii U sold during its launch week.